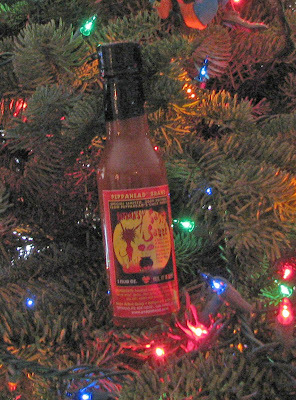 Today we have a fun hot sauce from the wild and crazy guy, Larry from 'Peppahead.com.' This is another limited edition sauce from Peppahead's chile patch. Peppahead went to great lengths to insure the quality of these ingredients. It was late in the season, the weather was turning cold and the habaneros had not ripened fully. Peppahead took these peppers and placed them into the back seat of his car. 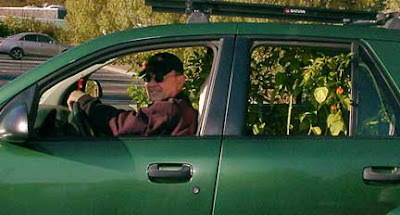 The car was like a portable green house. He took the peppers with him to the farmers markets and would place them in a warm spot while he sold his sauces and pepper products. When the peppers were ripened to the perfect degree he blended them with numerous other peppers. What resulted was a unique, flavorful treat for the hot sauce enthusiast. White, Gold, and Red Habaneros, Red Savina, and Dorset Nago chiles are the peppers used in this sassy concoction. They were mixed with rice wine vinegar, white onions, lime juice, shallots and zanthan gum. They were blended together and presented in a 5 fluid ounce container. The label shows a sassy female looking devil looking over a fiery cauldron of habanero peppers. It is a fun label, but one of my pet peeves of Peppaheads labels are, you have to have great eyesight or have a magnifying glass to identify all the details and text. The sauce has a wonderful habanero odor with a hint of vinegar trailing. The sauce is thin in consistency but not in flavor. If you like habaneros this sauce will not disappoint. The fruity hab flavor shines through with a burn to back it up. The heat level will grab your attention and keep you in a pepper choke hold for a while. It is not for the novice capsicum consumer. It will please the heat seekers with a wonderful pepper heat jolt. 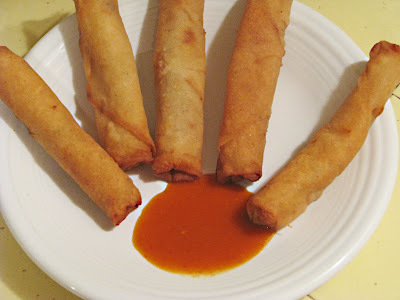 It was the perfect compliment to some Lumpia. It burned so good!!! Peppahead sells his products mail order and at several farmers markets. His sauces are made in limited quantity's. They are worth seeking out. It is always fun to see what he makes next. Dang man, nice post! I'm impressed. Looks good on the tree! I've also heard it's a good ointment to smear over horse kick wounds. Reverend, Holiday Cheers to you! Highlandsranchfoodie, That sounds like a wager brewing. How about a challenge, where we both make an appetizer for the other team. I will make an appetizer for the Bronco fans and you an appetizer for the,three time 'Super Bowl' champions, Silver and Black attack, Oakland Raider Fans? A Year on the Grill, Larry makes some good stuff. He is a dedicated chilehead. My eyes are watering, just looking at the photo. I think my aging digestive system just wussed out.